Motor yacht KNOT TIDE (previously SUSAN B) was launched by the American shipyard Hatteras in 2008 and measures 24.38m (80ft). 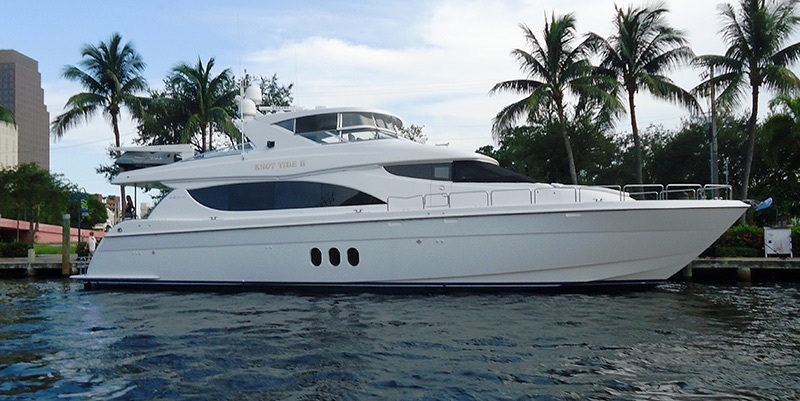 Available for deluxe yacht charters in Florida and the Bahamas, M/Y KNOT TIDE offers accommodation in 4 generous cabins, for up to 8 charter guests. Crewed motor yacht KNOT TIDE features an elegant interior décor of neutral soft furnishings, rich high gloss cherry woods and bespoke accent pieces, creating a timeless, inviting ambiance. The open plan salon and dining is spacious and ideal for entertaining. The lounge offers an L shaped sofa, occasional chairs and full audio and visual systems. Forward of the salon, the formal dining table is centered, seating all 8 guests with ease. On the starboard side forward is a foyer and day head, forward and central is the entrance to the fully equipped country style galley, while aft, the wide glass sliding doors lead into a perfectly shaded aft deck and alfresco dining option. Guest accommodation is below decks, in 3 double and 1 twin cabin, each with en-suite facilities. Exterior living is plentiful on 2 levels, offering ample areas to relax or socialize. The aft deck is shaded and boasts an alfresco dining option and built in seating, followed by a lower extended swim platform. Side decks wrap around the yacht, providing effortless access to the foredeck and a further seating option. The upper flybridge deck is well-appointed and features partial shade, an alfresco dining option, service station, full wet bar with stools, sunpads and deluxe Jacuzzi tub. The KNOT TIDE motor yacht is capable of 16 – 21 knots, making her a great choice for a Florida and Bahamian luxury charter. Below decks, the Hatteras 80 yacht KNOT TIDE offers accommodation in 4 cabins, for up to 8 charter guests, with the crew in separate quarters for optimum privacy. The master stateroom is amidships and full beam of the yacht, with a center lined king size bed, vanity, oversized hull ports and large en-suite. The VIP cabin is forward and full beam of the yacht, with a center lined queen size bed. A further 2 cabins offer a double bed in one and side by side twin beds in the other. M/Y KNOT TIDE is fully air conditioned throughout.